I stood outside the truck and there was another girl ahead of me ordering. It took a while and I was "Geez, how long does it take to order an ice cream sandwich??". But then it was my turn, and I found the girl working in the truck so genuinely nice and chatty that I wound up taking quite a few minutes myself! Despite their array of tempting options, the choice for me was a no brainer. Sweet Potato & Marshmallow? Yes, please. 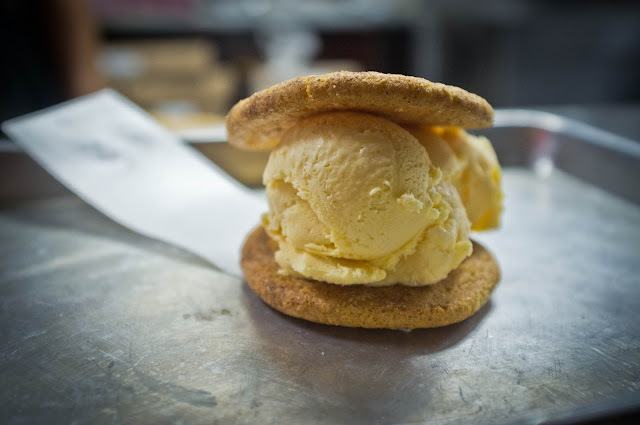 I suspected Snickerdoodle would be a good accompaniment and my new Coolhaus friend agreed that it would compliment the subtle flavor of the ice cream. As she handed me my sandwich she said something that I didn't quite understand, so I asked her to repeat herself. Wait, no, I did understand the first time. The wrapper is made from potato starch and is edible! How neat! Ice Cream Sandwich in hand, I started walking home with a bounce in my step. People left and right were recognizing the signature Coolhaus sandwich and giving me huge smiles. A couple of shop workers standing in the doorway of their store yelled out "I LOVE THOSE SANDWICHES". No joke. I felt like I was in the opening sequence of my own light hearted sit-com. Even after I was done eating, people were just WAY friendlier than usual. Coolhaus sells so much more than just delicious, unique flavored ice cream beneath two damn-good cookies. They sell summertime magic!